A sports hernia is the result of repetitive twisting and turning. This injury occurs in the groin. Athletes who perform these motions at high speed are especially at risk. 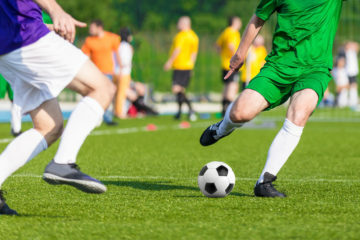 These hernias are common among soccer, hockey, and tennis players. Overuse of the groin muscles results in stress on the inguinal wall, which is located low on the pelvis. Muscles, nerves, and tendons may be injured even though there is no hernia. The injury can be quite painful. The pain persists as long as the athlete continues to participate in the sport. Likewise, the hernia symptoms are known to diminish during the off season. Resting is the first line of treatment for a sports hernia. The pain from a sports hernia is usually relieved with two to six weeks of rest. Since the injury may involve damage to nerves, muscles, and/or tendons, ice packs should be applied to the area. Relief can also be obtained by taking a nonsteroidal inflammatory medication such as Motrin® or Aleve®. Surgery is used as a last resort to resolve the pain of a sports hernia. Competitive athletes are more likely to have surgery to resolve the problem in the quickest way possible.